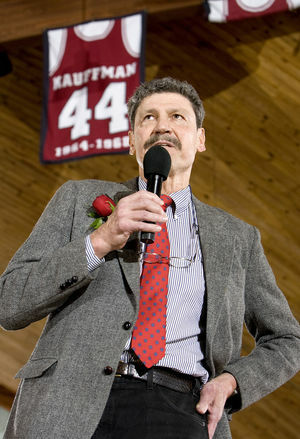 Kauffman speaking at the retirementof his jersey in 2009. Guilford legend Robert "Bob" Kauffman '68, passed away peacefully in his sleep July 27, 2015, in Lilburn, Georgia at age 69. He was, without a doubt, one of the most decorated and celebrated ballers in Guilford College history, earning induction into the Guilford College Athletics Hall of Fame in 1973, and having his number (44) retired to the rafters of Ragan-Brown Field House in 2009. Kauffman, a 6'8", 240 lb. native of Scarsdale, New York, was heavily recruited by many larger colleges, yet chose smaller Guilford, and was a key center for most of his college career (1964-1968) under Coach Jerry Steele (who was several times the NAIA and Carolinas Conference Coach of the Year). By his senior year, Kauffman was named to numerous All-American squads, racking up an average of 22.7 points and 15.9 rebounds per game. 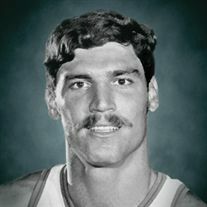 He tallied a total of 2,570 points and 1,801 rebounds in his 113 game college career. “What people remembered about my dad was he played very blue-collar. 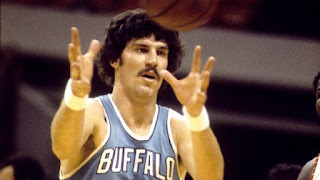 I think he was sort of a reflection of a lot of people in the Buffalo community the way he played. He wouldn’t back down from anybody. He played against Lew Alcindor [Kareem Abdul-Jabbar] at the time. 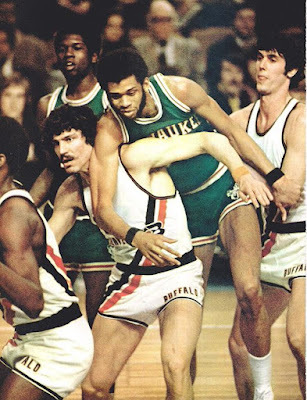 He matched up against Wilt Chamberlain. My dad would go head-to-head with those guys. Despite being a tough guy on the court, he was known as a "gentle giant" on campus. Very much the BMOC (Big Man on Campus), Kauffman was admired not only for his athleticism, but for his kindness and humility. Bob was a great college basketball player, but what set him apart at Guilford was his genuine affinity for his fellow students, be they athletes or non-athletes. 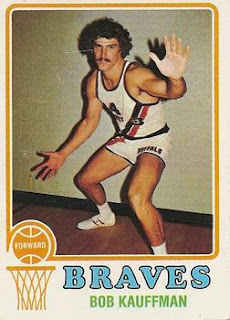 I was a scrub on the basketball team Bob's sophomore year and my lack of ability to compete at that level didn't keep Bob from treating me like I was a star. I only saw him three times after he graduated (except on TV), most recently at Guilford when his jersey was retired (I was there because my sister's jersey was being retired as well). Each time when we sat down and talked, it was if we were leaving practice and headed to the dining hall. He was truly a special person. Back at Guilford, there wasn’t a bigger man on campus than Bob, yet he was sweet and friendly with everybody. As a player, Kauffman paved the way for Guilford's becoming a national powerhouse program, winning 86 games during his four seasons at the College and three straight trips the the NAIA (National Association for Intercollegiate Athletics) Tournament in Kansas City. Several players from our NAIA Championship team recognized Kauffman as a major influence who inspired their quest for national prominence. I received my last E-mail from Bob on Friday and last saw Bob at the passing of Jack Jensen a few years ago. As a member or the 1973 National Championship team at Guilford College, I know what Bob and Judy Kaufman meant to the entire Guilford College Community. At Coach Jensen's funeral I remember telling Bob that M.L. Carr and Teddy East were my teammates but Bob Kaufman was always my HERO. "Our hearts and prayers go out to Bob's immediate family as well as to his greater Guilford family. Bob meant a lot to Guilford College and especially to all of us who played in the Cracker Box after him. He, Jerry Steele and his teammates set high standards for Guilford basketball. It was they who inspired us, the 1970 fourth place Quakers and the 1973 National Champs to go for the proverbial "brass ring." 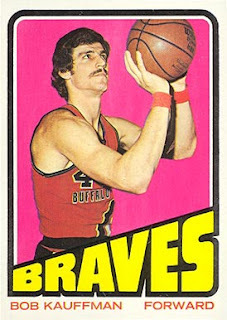 Every time Bob's name was called as a starter for the Buffalo Braves, it made us proud. He will forever be remembered for his contributions to Guilford College. He will be solely missed by all of us who got to know him. With a very heavy heart, we send our love and best wishes to Judy and the family." Kauffman would play four years with the Braves and a year with the Atlanta Hawks before nagging hip ailments forced him into permanent retirement as a player in 1975. He would go on to be an assistant GM for the Hawks for two years before being tapped to lead the Detroit Pistons as GM in 1977, ending his career as head coach of Detroit in 1978. Kauffman was a respected member of his suburban Atlanta community, a loving, supportive husband and father to his four daughters, who would all go on to be college basketball superstars in their own right. He enjoyed cooking, attending his daughter's games, cheering on local high school basketball teams, being an active Guilford alumni, and assisting his wife in her business ventures. He will be sorely missed and the Guilford community will hold them in the light.